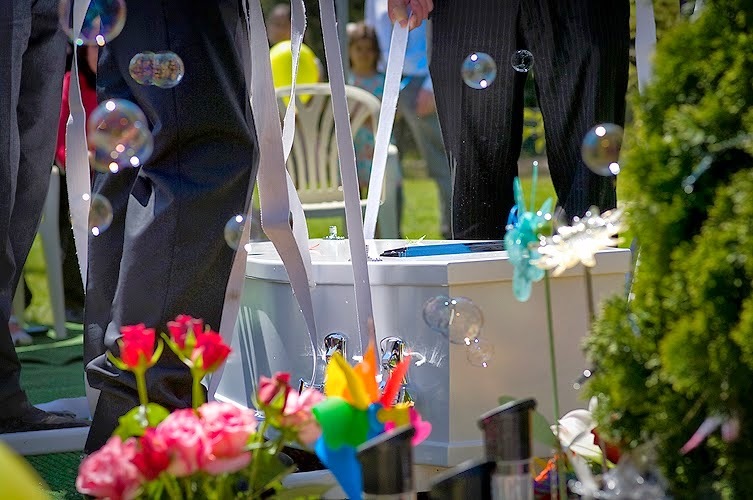 As florists, we're often aware of concerned family and friends who wonder how to help when a child dies. They come to arrange Sympathy Flowers for bereaved parents and grandparents, and often feel overwhelming sadness and helplessness. They often ask how they should reach out and support during tragic circumstances. Today we asked Lisa King if we could share her thoughts on specific ways to help and support when a child dies. ...depending on how close you are to the person. Having heaps of visitors just after someone has passed away can be too hard, especially if they are people you aren't close to. If you want to let someone know you are thinking of them, but you would never have dropped into their house any other time, then don't go. Send them a card, flowers, an email or a text instead. It's lovely to know that so many people care, but it's so hard to talk to so many people when you are just surviving, especially people that you don't feel comfortable with. If you are a close friend, you may not know what to say or do and that's okay. Just be there. Be honest and tell them you don't know what to say, but just be there and listen. It's better to say that you don't know what to say, than to say things that are going to hurt more because you feel awkward. If they don't want to talk, still just be there. Just hold them, hug them and let them know you are there for them no matter what. Get busy around the house and just let them know you are there. Don't say 'let me know if there's anything I can do'. Everyone means well when you say this, but when you are overwhelmed with grief and shock, you don't even know what you want. Just jump in and do something - anything. Help in practical ways. The last thing you feel like doing is eating, let alone cooking. Drop off meals in disposable trays or plates, so they don't have to worry about which dish belongs to who, and how and when to get it back to you. If they have a big freezer bring meals that can be frozen. You don't feel like cooking and eating for months afterwards, so it's nice to be able to pull out a frozen meal when you're having a particularly hard day. If they have other kids, bring food for school lunches. It's such a help to have pre-made sandwiches and treats which you can pull out of the freezer. Ask if you can help at all with funeral arrangements. Can you help find and sort out photos, or help make a special display? Do they need help finding an outfit to dress their child in? Do they want help with dressing their child. Do they need help with other things like arranging flowers or providing food for afterwards? How are they going to pay for the funeral? Do they need help with this? You may not be in a position to help personally, but may be able to work out a way to help them. If they have kids ask if they would like you to take the kids out for some fun, for a few hours. They may be grateful to have some quiet time, where they can let the tears flow without worrying the kids, or they may want to keep them closer than ever before. Just ask and see how they're feeling. Send a card. It seems like something little, and at the time you get many cards, but months and years later it's so nice to be able to pull them out and reread them again. It reminds you that so many people care. After Noah passed away we were given beautiful and thoughtful gifts from many people. These things meant so much as they acknowledged Noah and how much we loved and missed him. We were given beautiful jewellery and figurines, plants for the garden to plant in memory of him, books, photo frames, quilts, vouchers for meals and many other things. Don't just be there early on, but be there weeks, months and years later. Send cards months later just to let them know you're thinking of them. 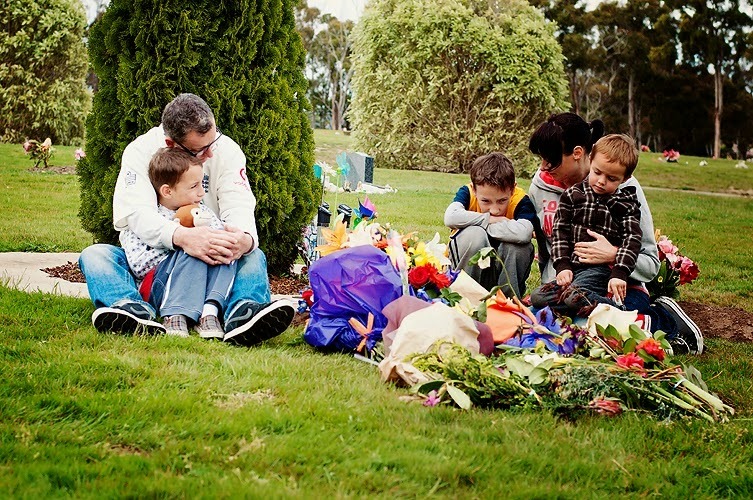 Remember their child's birthday and know that this will be one of the hardest days. Send them a message or a card, to let them know that their child hasn't been forgotten. Know that Christmas and Easter and every other holiday now feels so different, and are especially hard. Grief is so lonely. The days are long and the nights are even longer. It's especially hard when their partner goes back to work for the first time after their child has passed away. Invite your friend to join you for lunch or a play at the park with their other kids, but don't be offended if they aren't up to it. Keep asking. There will be days when they want to get out, and other days when they are just wanting to be alone. Their child passed away. They were once here. Mention their name and talk about them. Cry about them, and laugh about them. You may be scared to mention their name as you don't want to upset them or make them cry, but they're sad anyway. They're always sad. It means so much when someone mentions your child's name, because you realise that they are missed by others, not just you. A beautiful couple from church recently lost their three month old baby, very suddenly. I wasn't close to them, but knew that they wanted to talk to me so I went to visit them as soon as I could. The husband apologised to me and said he was so sorry that he didn't hug me more after Noah and Aaron passed away. He said he was away when Aaron passed away, and he was very nervous about seeing me for the first time when he came home. He said he came to church and expected to see everyone hugging me, but no one was. He said all he wanted to do was give me a hug, but because no one else was, he didn't feel like he should. When his daughter passed away, he then realised that all they wanted was hugs and acknowledgement that it had happened. He said he was sorry he never hugged me, and said 'everyone needs hugs'. Since that day, every time we see each other we give each other a hug. It hurts so much when people just act like everything is 'normal'. Life is anything but 'normal' now and just someone saying 'you're in my prayers', 'I'm thinking of you', 'how has your week been?' or giving you a hug or a rub on the back as they walk past, means a lot. Sometimes people say things, hoping to help, but instead they can really hurt. "You're lucky they won't turn into a teenager" (I'd give anything for him to be here and to be a teenager!). "You're so lucky you have your other boys" (yes I am, but I felt anything but lucky at the time). "You're so strong, you'll be okay". (There are many days when I don't feel strong, and I don't want the pressure of having to act like things are okay). Ask how they're doing, and be prepared for the answer. If you don't want to really know the real answer, then it's better not to ask. You know when someone genuinely wants to know how you are, and when someone just wants to hear the words 'I'm good'. We know you can't fix things, but just listening helps. Don't assume that you know what they're going through, even if you have lost a child yourself. Don't compare your grief to theirs. Everyone is different, and has different experiences. At the time you can't even think about what others have been through, and it puts pressure on you to stop feeling the way you do. I used to hear the phrase 'just taking it a day at a time'. Grief isn't like that at all. You don't take it a day at a time. You can wake up feeling okay, but an hour later you can feel overwhelmed with grief. You can wake up feeling terrible, but then by lunch time you feel like you can face the day. Be aware that your friend is taking things just an hour at a time. Check on them regularly. Ring them in the morning, then send them a text at the end of the day. They may not always have the energy to talk in person or on the phone, but just somehow let them know you care. It's hard to watch someone in so much pain, but allow them to deal with it how they need to. It's okay if they want to stay in bed, as much as it's okay if they want to keep busy. Don't tell them that they should or shouldn't be doing something. No one should feel like they're being rushed along the road of grief. It takes years and years, and there will be many bad days and better days for a long, long time. If they want to talk about what happened, let them. Part of the healing is talking about the details. Don't tell them that it's time to 'move on'. 'Moving on' is such an awful term. It makes you feel like you are leaving them behind. No one wants to leave their child behind and forget them. All a parent can do it to try to work out best how to continue on without their child here on earth. If they're having a terrible day don't assume they're not coping. If it's months when they are really struggling, then maybe they need some extra help to get through it, but they're going to have many terrible days, before there are some better ones. If they're talking a lot about them years later and are still sad, it's okay. They will love and miss them forever. If they're having a 'good' day don't just assume that they're doing okay. They may be out and about and smiling and talking, but their heart is still broken and they still need your love and support. I will probably remember a lot of other things after I've posted this, but hopefully this will help someone who may not be sure how to help a friend, after their child has passed away. It's a long and lonely road, but with great friends the journey can be made a lot easier. I believe that this is one of the ways that God works - through others. I'm so grateful for special friends and family who have loved and supported me, and allowed me to deal with things how I have. Without them it would be a lot harder every day. Thank you Lisa for sharing so honestly and openly how we can reach out during times of heartache such as when a child passes away. Lisa blogs at www.lisaking.blogspot.com.